Krispy Kreme donuts are crack. I don’t eat a lot of junk food. Not because I’m healthy or smart, but because I hate how crappy my body feels afterward: achy, sluggish, no energy–kind of like a hangover. Which is also why I don’t drink. But the older I get, the harder it is for my body to process crappy food. Like Krispy Kreme donuts. Yet they are oh so delicious. So after breaking numerous traffic laws to get to Krispy Kreme (did I mention the fresh donut light was on?) before that damn light went out, we decided to hit the drive-through. Because when you’re about to ingest 7,000 calories, exercising your way into the donut shop seems extra. As did the medium diet coke I ordered. As Tony ordered half a dozen crack donuts, I heard the skinny voice come through the order intercom to offer to upgrade our purchase to a full dozen for only $1.49 more. Does anyone actually say ‘no’ to that??? Needless to say, for a little over ten bucks, we were handed a box of a dozen extra hot Krispy Kreme donuts and a large diet coke (yeah, I realize the irony) of which I ate 3 before we even exited the parking lot. Crack. But the problem with offering a deal for double the donuts is that human nature tells us to then eat more donuts. Does anyone actually feel good after eating these things? If Krispy Kreme had been satisfied with making $8 from us, instead of $10, I’d probably have eaten less and felt better. So they gained a buck fifty yet I have a negative recollection of the experience. 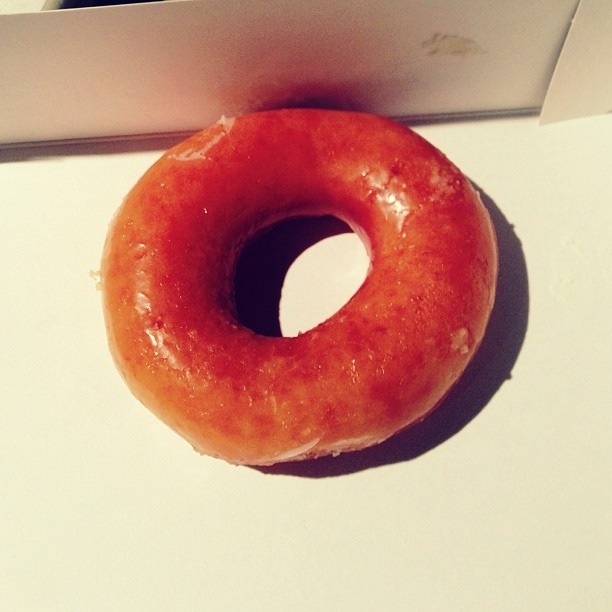 It will probably be awhile before I go back and binge on Krispy Kreme crack. A long time. Do we do this in the music industry? Do we offer too much music leaving a bad taste in fans’ mouths? Or do we keep them wanting more?? I remember years ago when we worried about over saturating the market with an artist. While it was good to be seen everywhere and anywhere for the sake of awareness, people who saw the artist over and over and over were prone to get a bit burned out on him, or her. The challenge was always how much is enough?! I’m still of the opinion that less is more. Leave them wanting more. Don’t over saturate the marketplace. Paris Hilton reconfirmed this to me a few years ago. Kim Kardashian is doing this now (and has been). I burned out on seeing her months ago. Rap is over saturated now. Every time I see a music or video link by an unknown artist on my twitter, I roll my eyes as I delete the offending link–and I’m pro-artist!! Too much music has left me as over stuffed as those darn Krispy Kreme donuts. And when I think about going back to Krispy Kreme now, two weeks later, I recall that horrible feeling I get after eating them. I don’t miss them one bit. I think the trick is to be sensible, with donuts, music, anything we offer to the masses. Hearing that famous rapper of the moment on every song isn’t great marketing, it’s over saturation. I just don’t need to see him, or anybody, every time I surf the web. This is a culture of fans who build up the underdog and then tear that star down when they get too big. We can at least allow them a slow rise to savor the fame. I guess it’s all about your vision: are you a short term visionary or a long term visionary. I’m in it for the long haul. Meanwhile, I don’t think I’ll be eating Krispy Kreme donuts for a very long time. ← Who Are 20 Richest Hip-Hop Stars? Making the connection between Krispy Kreme and music is pretty genius, Wendy. I have noticed lately a slight urge to vomit whenever I hear “Mike Will made it” or “2 Chaaainz”. But I also understand that when you have limited talent combined with a history of scarcity, it’s hard to step back while you’re still in your 15 minutes of fame. Yessss…history of scarcity….so the rest of us have to put up with having it rammed down our throats ad nauseum. LoL. Thanks for your valuable input! I hadn’t thought about the scarcity angle. Great point. A great analogy. In America unfortunately quantity usually trumps quality in many things. We are an acquisitive society. We ache for more – more material goods, more money, more food, more drugs, more love – instead of appreciating the preciousness and art of what we already have. Do we have more overweight people, more addicts, more hoarders, than other societies? I don’t know, but it seems to be that way. The empty calories of pop music injected into our veins through every possible media outlet don’t leave my musical soul feeling very satisfied. It sure does seem to be that way. It makes me long for more earplugs. Hahahahahahahaha. My soul is dissatisfied too!